Continuing its strong growth the UKIFC takes on its first international Board Member. Ajmal Bhatty is a thought leader and pioneer in takaful and ethical investment solutions, Ajmal has over 35 years of international experience (17 years at C-level) in financial services sectors. He has been instrumental in developing and managing insurance institutions in challenging environments. An actuary by profession, Ajmal has provided advisory and technical support to regulators and standard setting bodies on Takaful in several jurisdictions in the Middle East and Malaysia. 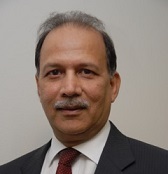 On joining the UKIFC Board, Ajmal commented, “UKIFC is one of the most effective platforms in the promotion and development of Islamic Finance and probably the only most active platform for identifying interfaith shared values with Islamic Finance; this is most commendable for the general awareness and promotion of Islamic Finance in the context of Ethical Finance. Takaful and Micro-takaful have not had similar promotion and development in terms of customer recognition of their ethical dimensions when compared to their conventional counterparts. There is still a disconnect with takaful of the various areas of Islamic Finance such as project finance, long term sukuks and private equity initiatives. Takaful is perceived more as a product than a system. Whilst it is the industry itself that needs to address such issues, the platform of UKIFC can be a great catalyst in debating the issues and bringing about a change in the current status quo and in the mind set of regulators, entrepreneurs and practitioners. As a member of the advisory board of UKIFC, I would address pertinent issues and areas that would enable it to support the promotion, growth and development of Takaful in areas and markets currently not yet developed, or where it is in initial stages of development. This would be the OIC markets as well as markets where Takaful should appeal to everyone on ethical grounds. Islamic micro-finance and micro-takaful are very much needed. Working with government bodies as well as the private sector, UKIFC can be instrumental in bringing micro-solutions to several Muslin countries by helping to develop specific regulations, guidelines, training programs and by mobilizing relevant resources through NGO’s and takaful companies in helping to develop viable propositions for financial inclusion and protection of the masses.